But Berkus and Brent are in the business of emotions. Their forte is creating inspiring environments that tell the story of the people who live there. That very philosophy formed the basis of their new furniture collection for . "We want people to tell their own stories in the home," Berkus tells me. "We're not dictatorial in terms of what we think anyone else should be living with, but if we provide the silhouette and the shape and the option at prices that people can afford." He points to the famous faux-sheepskin in their family room, which they both loved so much they had to bring two home. As Brent explains, it's also kid-friendly, so you can take a wet rag to it. "It's not precious," he adds. With so much of their day-to-day together, from the office to home, I quiz them on how they make it work and find the time to spend time together. They both express how critical date night is, but beyond that, they each believe in quality time alone. Brent loves to channel Demi Moore in his own , which even though he hasn't done for a while he admits is "deeply therapeutic." He says, "I like to close the door, turn the music up, and light every candle known to man." He also makes time to meditate in the morning, relishing what he can discover about himself with just 30 minutes of alone time. Despite their similarities and sensitivities, they're both quick to admit their differences too. In fact, Berkus stresses how distinctly different they are as people, which has also helped them craft separate careers too. 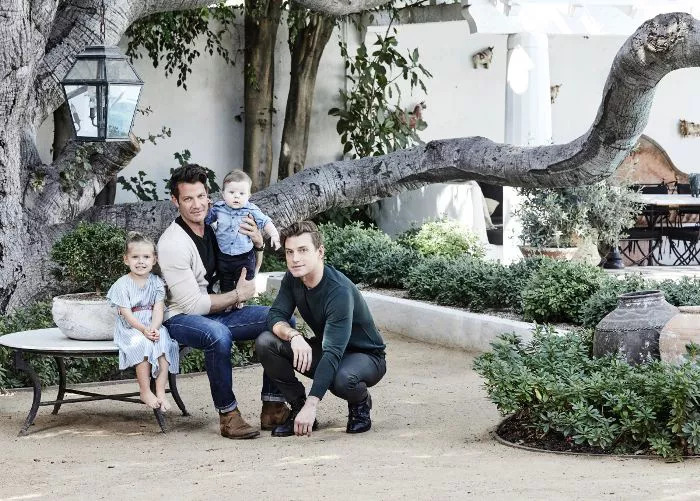 "We cross over when we can and when it's appropriate, whether it was the show (they host on TLC) or the furniture collection (for Living Spaces), and that's the fun stuff," he says. "That's when you just get to get in there and enjoy each other and create together, which we love to do." Outside of the work they do together, they also run their own self-titled interior design businesses— is based in Chicago, while is L.A.-based—which they are quick to remark are very different in aesthetics and design style. However, they do have one thing in common. Just looking around the house, you can also quickly decipher that they're both fairly color-averse, too, erring on the side of with a hint of . Berkus skews darker and moodier while Brent generally skews lighter and brighter. When I raise the topic of color and elude to Berkus favoring color over Brent, he was quick to dispel my assumption. "No, I've actually always been drawn to a lack of color," he affirms. "I remember my first apartment in Chicago, I could barely afford a sofa and I had no color; it was black and white and tan and gray.